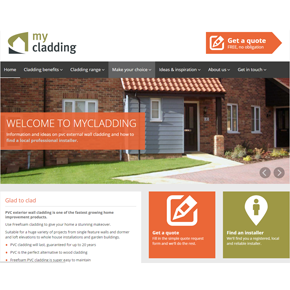 mycladding.com is a new website launched by Freefoam Building Products, designed as an online portal to share product information about PVC cladding and provide easy access to a free, no obligation fitting quote from a local installer. The website has been created as a response to the increased interest in PVC cladding, with volume sales up by 61 percent year on year. mycladding.com features information about different cladding finishes and information on the benefits of using cladding to improve insulation and reduce maintenance. Freefoam have added several features to mycladding.com to help the specification process, including an online tool to help the homeowner visualise how cladding will enhance the look of their home with colour options superimposed on a variety of house types. The website also features a sample request service and a calculator to estimate the number of cladding boards needed for any project.